I came across an interesting article in the Wall Street Journal via one of my favourite blogs, Faking Good Breeding, about Seven For All Mankind's efforts to diversify its clothing line and expand into shoes, handbags, and casual clothing. The article pointed out that many one-hit wonder apparel companies that hit the stratosphere with one product are trying to diversify. It's not just Seven who's getting in on the game: the makers of Ugg boots are trying to launch other boot designs, the company that makes Crocs is introducing a clothing line, and so on. The article stressed a lot of branding anxiety. Would expanding the product line be equated to going mainstream, thus diminishing the Seven brand's cool factor and exclusivity? Would that end up hurting the jeans company's bottom line in the long run? Would Seven be able to replicate its success with jeans in its other product lines? After all, companies like Von Dutch Originals experienced lacklustre sales when they branched out into other accessories and away from their famous trucker hats. These concerns are valid, but I think that when it comes down to it, the product speaks for itself, and these executives should stop focusing so much on branding and start thinking more about design. 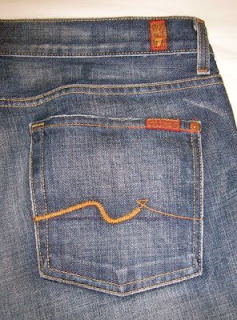 The entire reason Seven For All Mankind became such a well-known and sought-after brand was because it represented quality denim and a flattering fit. The founders of Seven spent a lot of time and energy perfecting the look of their women's jeans, and the entire company was founded because of that driving purpose. Often what happens with branding expansion is that the initial creative drive gets diluted, and in some cases, it's diluted to the point where the "new line" doesn't represent much effort other than slapping the brand or logo on products of dubious quality and bland design. If Seven concentrates on making good-quality, well-designed clothing and accessories, I don't think they have anything to worry about with their brand expansion. If, however, this is just a ploy to get fans of their jeans to blindly buy crappy merchandise with the Seven brand on it, the customers will know and their bottom line will suffer.